Around 7pm, performers arrive at the performance location with their costumes. A small make up room is provided. On the wall facing the east, a trident symbolizing the Goddess Amba is drawn with red kumkum powder. A trident is also drawn on the instruments as well. An oil lamp with incense is lit and the actors sing prayers to invoke the blessings of the Goddess. 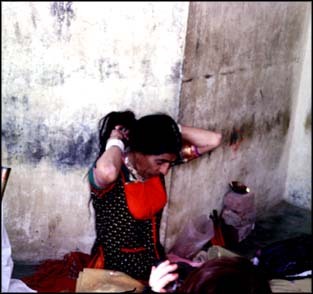 After that they begin applying their make up by putting on oil from the lamp. Other make up material consists of yellow powder and black Kajal (soot) from the lamp. Make up is specific to type of character. For example, Juthan, a comic character paints white and black patches on his face. Zanda, a hero, has a white face with long hair and beard. A Brahmin places a Tripunda (caste symbol) mark on his forehead. The Goddess Kalka colors her forehead with red powder. Men wear moustaches and if the character is Muslim or Sadhu they wear a beard. Female characters have red bindi marks on their foreheads. After finishing applying make up, actors take out their costumes. Female characters wear large flowing skirts with bright colors, choli blouses, and a sari or a half sari (odhani). Tikkas and earrings are worn on the head, bangles on the arms, and ghungroos bells are tied to the legs. Men wear tight Salwar pants and long sleeve Jhabbho or Jamu (with fringe) shirts. Male characters wear Paghdi or Mandil turbans on the head, Bheta sashes on the waist and Mojeli slippers for footwear. 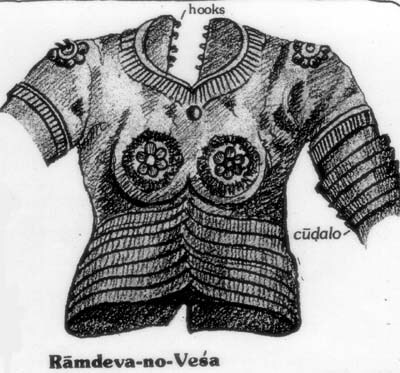 Prinicipal characters have special costumes reflecting status and religion. Zanda Zulan wears a long white ankle length Jama, a green Zabbha, a long conical hat stripped with brocade and peacock feathers. He also carries a spear with a torch in it. The character Batau in the vesha Chhel Batau wears a turban decorated with brocade and has a sword. Different types of turbans are used depending on what community the Bhavai performance is in. After the actors are finished putting on costumes and make up, another prayer is sung to the Goddess Amba asking for success in the performance. 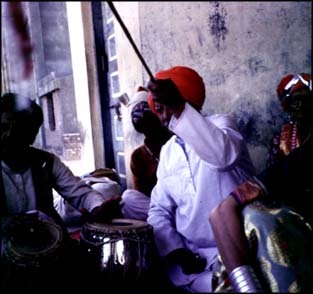 Finally, the musicians enter the acting area and start playing music and singing prayers so that the villagers know the performance is about to begin.